As much as SEO has been an important factor of website positioning since it directly helps with ranking and organic traffic, here’s another strategy that has started to directly influence SEO. It’s user experience (often abbreviated as UX). Over the years, understanding UX is more and more important as this has become an effective method to improve SEO. Want a quick recap on SEO? Here’s our free SEO course where you can learn all about what SEO, how to implement it and how to get the most out of it: SEO Certification Course. 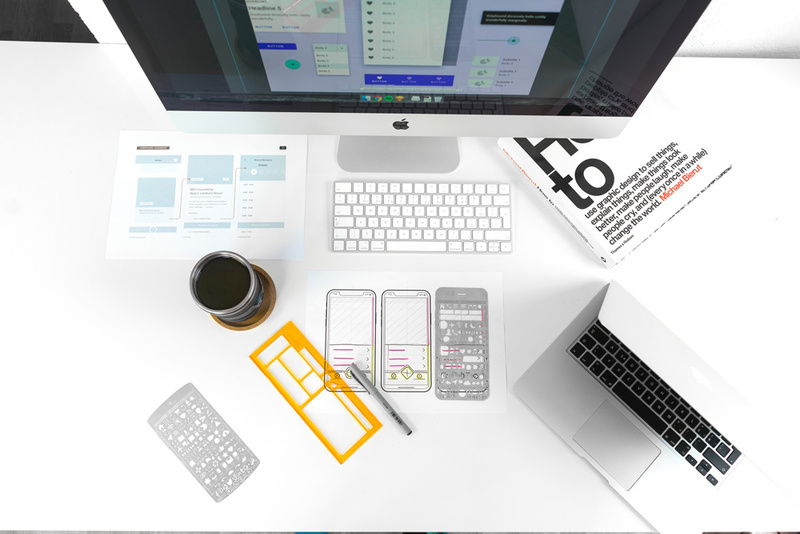 Before you even begin to understand how UX affects SEO, you need to understand the core aspect of UX. It’s short for user experience, and most commonly, it’s associated with design. It represents users’ emotions and attitudes towards a certain product or visual asset. The experience is subjective, dynamic and influenced by the ever-changing circumstances surrounding each user. In marketing, it’s a metric helping business to assess the effect design has on the users. Since the purpose of design is to encourage association with a specific topic and certain emotion, testing UX is a way to make sure the design conveys the right message. In a nutshell, user experience helps you understand how users perceive your design. It’s a continuous process of making improvements and adjustments which are all created in order to improve how users feel about the design. What traditional SEO has been teaching you is to design a website with best SEO practices in mind. You need to learn how search engines “see” your content, and optimize that content accordingly. The better they understand the content, the better are the chances that search engines will index such content properly and show it in relevant searches. Now, that’s a technical side of the SEO. Those practices are still valid and important in the process of website optimization. However, search engines have always been analyzing how users interact with your content. With development of advanced algorithms and the ability to understand user behavior better and to even predict their queries, search engines now take into account this behavior as well. What this means is that today, it isn’t only about how search engines see your content. Search engines now have the capability to understand how users see your content. Tracking and analyzing user behavior enables them to deduct if the page is user-friendly and relevant for the search query. Here are four user-related elements that are also relevant in terms of SEO and website positioning. The idea is the following. More time spent on your site is a positive thing. It means that your content is relevant for the search query. It also means that the users find it useful/engaging/interesting since they spend that much time on your site. That is why providing a better user experience on your site directly impacts your SEO. This one is a negative metric. In fact, it’s exactly the opposite from the previous one. Bounce rate represents the percentage of people who left your site after having visited only one page. They read or partly skimmed the page, and then they just left. You didn’t succeed in engaging those users. Again, Google Analytics is an ideal tool to discover this metric. Read more about how to reduce bounce rate in this article: How to Reduce Your Website Bounce Rate: 20 Tips That Work. Lower bounce rate has a positive impact on how search engines indirectly see your content through user behavior. Use different strategies to test various approaches with your content and compare the bounce rate. Unlike the previous two, a repeated search isn’t your site metric. Instead, it’s an indicator that search engines have and it works something like this. Users type the search query, and they are presented with the list of the search engine results. Most commonly, they click on the first result, and in this example, let’s say that is the case. The first result has been filtered by the search engines as the most relevant for that search query. When the users repeat their search, search engines take this as a sign that the first result might not fully or at all provide the solution. This is why the search query result page is changeable. It’s shaped based on many factors and one of those is how users react when presented with the content. Google now has featured snippets in its search result page. This is a block shown at the top of the search result page and the idea with this block is to show the summary of the answer extracted from a web page. It’s a quick and easy way to find information without even visiting the website. This block has a feedback button as an option. Its purpose is to get feedback from the users and determine if there is something wrong with the content shown in this block. Find out more about Google’s featured snippets and how to optimize your content to be included in these results: Google Featured Snippets Optimization. The reason why these metrics are part of SEO is the fact that search engines are focused on one goal – to provide the best user experience. They want users to get the most relevant information and they want to filter the huge amount of content being shared online and only present quality to end users making the queries. That’s why analyzing user behavior and these metrics help them improve the way they display search results. Of course, this includes improving the delivery of the search engine ads. Analyzing user experience requires a process where it is possible to make conclusions. Therefore, the team at Google has developed a framework that is used for this purpose. The idea with the HEART framework is to automate the process of analyzing user behavior and getting feedback. This automation enables them to expand the influence of such a mechanism on a large scale. Here is how it works. The word is an acronym that actually represents the key metrics relevant to the framework. This metric shows the attitude towards your products, overall satisfaction. Some ways you can test this metric is by using surveys, reviews, etc. Engagement level can be determined by analyzing your site statistics. Try comparing the number of visits with unique visitors, analyze session duration, etc. Adoption represents a metric indicating your success in getting and keeping the new users. In fact, this metric doesn’t directly refer to user experience but customer experience, although it comes from UX. Great user experience will improve adoption metric as more and more users will become a part of your business. This metric refers to the long-term usability. For example, one way to analyze the retention rate is to discover the number of returning customers. It’s an indicator of how good you are at keeping your audience. The final metric is actually a collection of several factors. It refers to the time needed for the users to complete each task (such as sign up, download, fill in the form, etc.). Providing better UX means reducing the time needed for these tasks. Now, there are there more things to have in mind when it comes to the HEART framework. 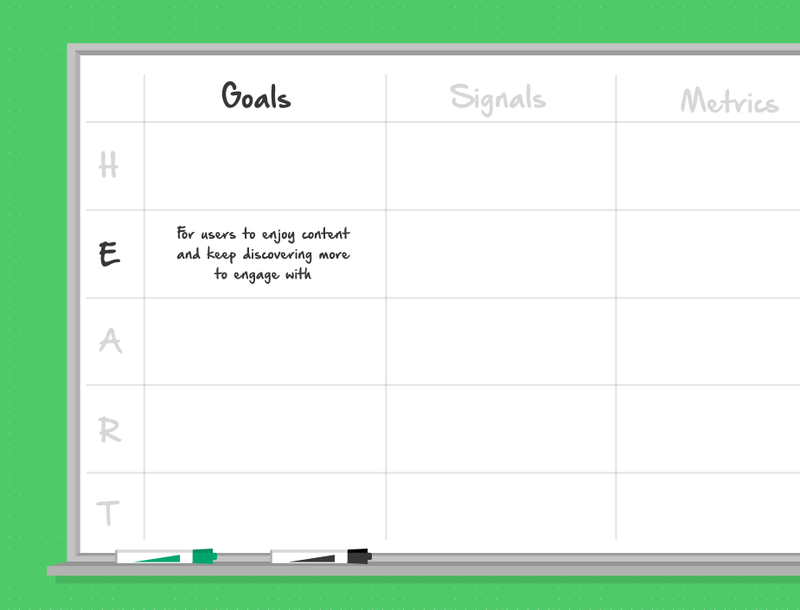 The first part of analyzing each of the HEART metrics is setting up goals. Once you understand what each metrics means, you need to set up goals that you want to achieve for each of them. For example, if you analyze engagement, your goal could be to engage more users, to keep them happy and encourage them to use your website. The next step is to define the signals that will help you determine and keep a record of that metric and how it changes over time. Getting back to engagement metric, now you can define the exact actions that help you decide that something is a signal that indicates engagement. It can be an increased number of visitors, higher average time spent on site, etc. At this point, you need the actual numbers. So you’ve started with descriptive goals, you narrowed them down to signals and how it’s time to determine the exact metrics that will help you analyze each part of HEART framework. The statistics relevant for this example of analyzing engagement could be average session duration, the number of conversions, bounce rate, etc. Learn more about SEO metrics here. Let’s look at another example by analyzing adoption metric. Your goal should be to get new users to adopt your website/app/product. The signals that could indicate this include using a feature, visits, creating an account or maybe downloading an app. In the end, focus on metrics and define the exact actions that can indicate the performance of adoption. These can include registration rate (compare the number of users and those who create an account), download rate, etc. So, the idea with the whole process is to analyze each metric of user experience individually and determine the process that will guide you from setting up goals to analyzing the results. Also, have in mind that this process is completely unique for your business. There is no ready-made table that can guide you through the process. To be able to create it, you need to understand your business model and how online users interact with your content. The final goal is to use this table to define ideas that will help you create a better user experience on your website. The final idea is that your website needs to grow along with the trends, strategies, and processes implemented globally. Now that user experience has such an impact in shaping the search results (and thus directly affecting business performance), make sure your business strategy is oriented towards understanding and improving this experience. Great user experience can really make or break the deal. Your site visitors come from all over the world, have different technical backgrounds and belong to very different age groups. Businesses need to make it really easy for visitors to engage with their products and services. Visitors should never need to jump through the hoops to get value from what your business has to offer, as in most cases – they’ll just close the page and go to another website without thinking twice. 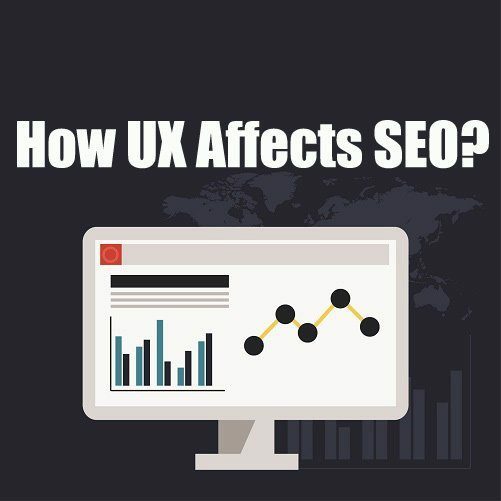 This is why UX is so important and needs a closer look, not only for now obvious SEO reasons we’ve discussed but also as a factor that directly influences your business performance as well as customer retention and satisfaction.